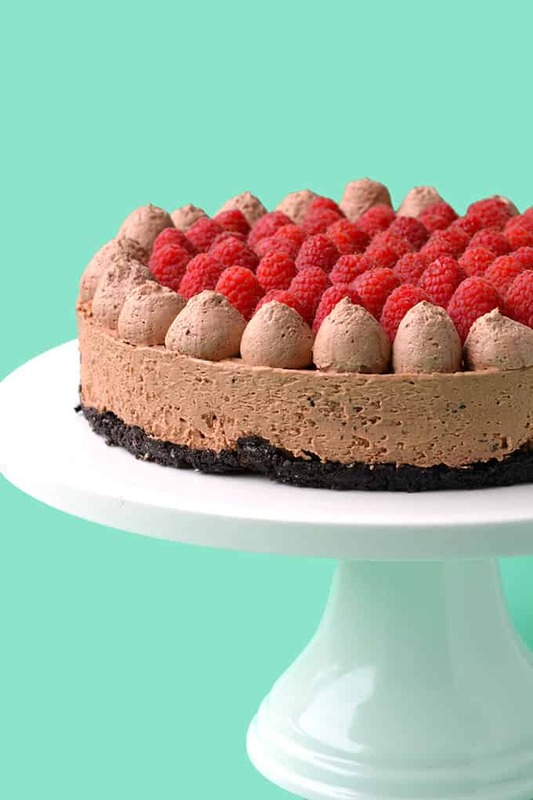 You don’t even need to turn the oven on for this gorgeous No Bake Raspberry Chocolate Cheesecake. 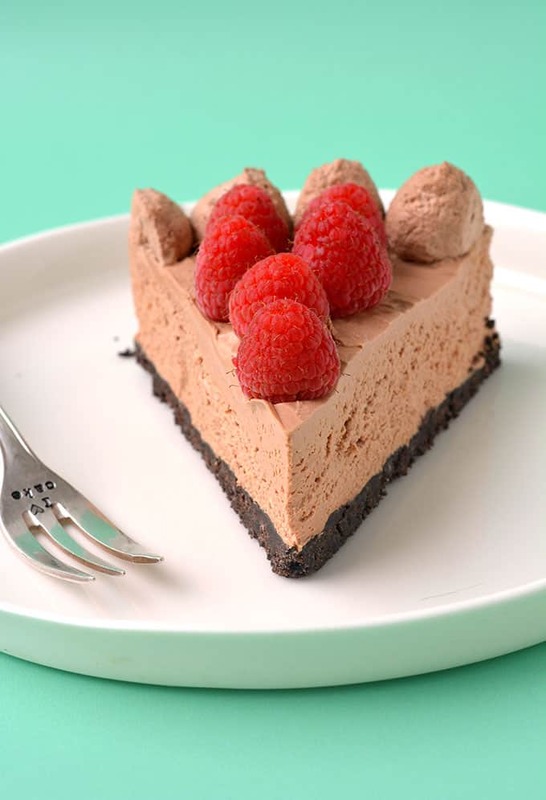 It features a crunchy Oreo crust and a topping of fresh raspberries. 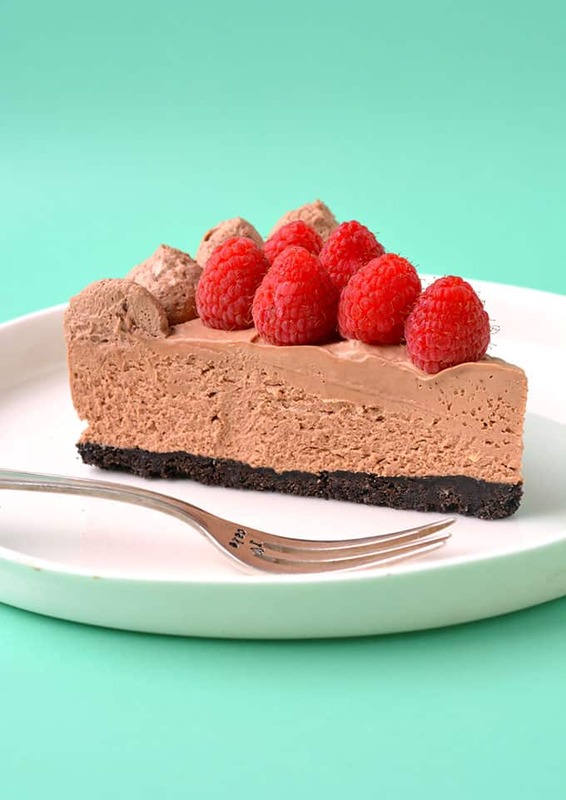 Introducing the ultimate No Bake Chocolate Cheesecake that boasts a seriously creamy – almost fluffy – texture. With an Oreo crust and loads of fresh raspberries, it’s the perfect dessert. 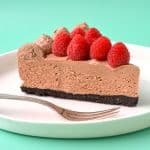 Whether you’re on the hunt for a simple no bake dessert or a chocolate cheesecake that’ll wow a crowd, I’ve got you covered. One of our favourite places to go to when we visit America is The Cheesecake Factory. We seriously love it and usually end up going there multiple times each trip. I always opt for a slice of their banana cream cheesecake – comfort food at it’s best. But as much as I love baked cheesecake, a luscious no bake cheesecake is my weakness. 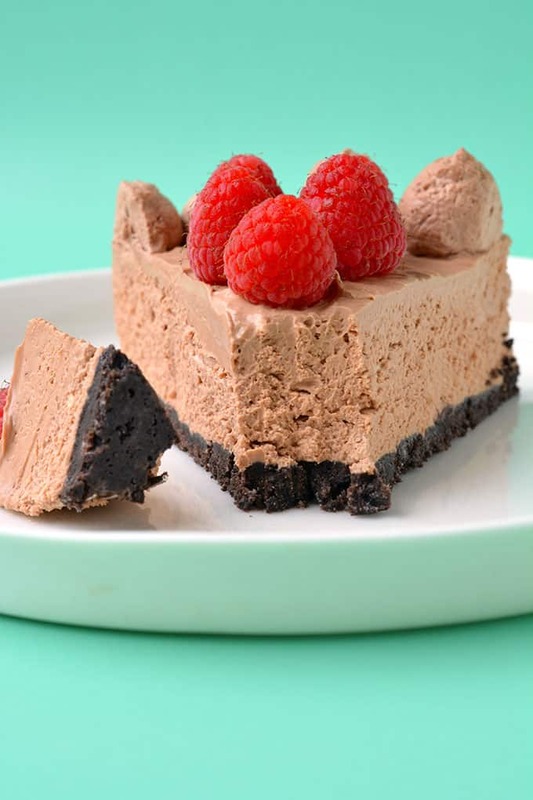 So this No Bake Raspberry Chocolate Cheesecake is my dream dessert. It starts with an Oreo crust, so you know you’re already winning. And next comes that light-as-air, melt-in-your-mouth chocolate filling. 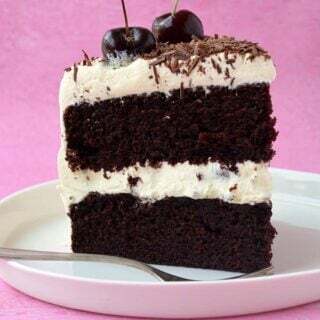 Made with cream cheese, chocolate and whipped cream, it’s wickedly delicious. The best part? It’s completely no bake – you don’t even have to turn the oven on. If you’ve had cheesecake woes in the past, try this one. No water baths needed! And NO gelatine. The final touch? A stack of fresh raspberries and clouds of chocolate whipped cream. 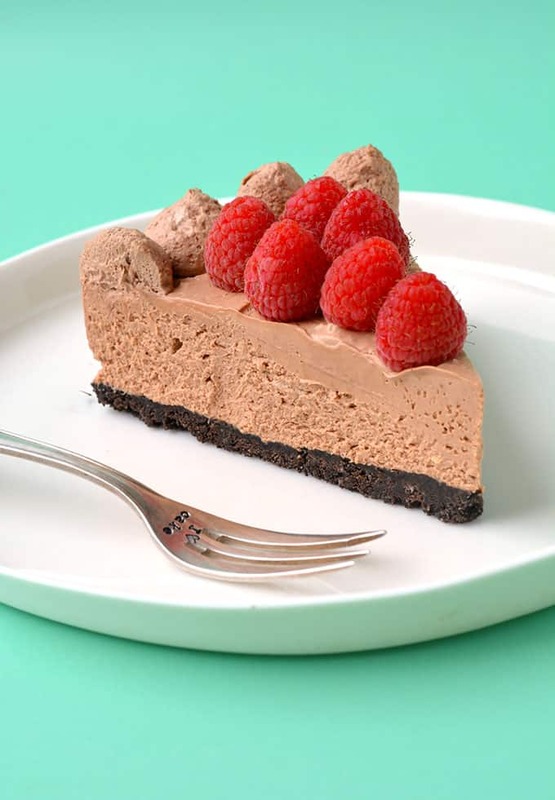 I don’t know about you but Oreos + chocolate cheesecake + raspberries = best dessert ever. A creamy chocolate cheesecake with an Oreo crust. Lightly grease a 9 inch springform baking tin with a little butter and set aside. Add Oreo cookies (cream and all) to a food processor and blend until they resemble fine crumbs. Melt butter in the microwave and pour over your crushed Oreos and whiz again the mixture resembles wet sand. Pour Oreo mixture into your prepared tin and press down gently to form an even layer. Pop in the fridge. Add cream cheese, sugar and vanilla to a large mixing bowl and beat with an electric mixture until smooth and creamy. In a separate bowl, add cream and beat with an electric beater until whipped. Finally, melt your dark chocolate in the microwave until it is just melted – give it a good stir. 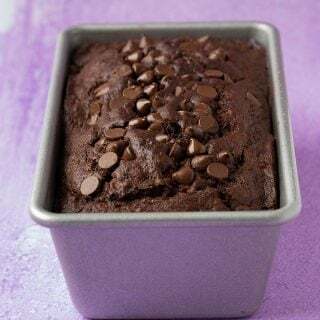 Add your chocolate to your cream cheese mixture and beat until smooth. Then gently fold through the whipped cream. Pour your cheesecake over the top of your Oreos and refrigerate for at least 4 hours or, even better, overnight. To decorate, place cream in a large mixing bowl and beat with an electric mixer until stiff and whipped. Then sift in icing sugar and cocoa and gently fold through. Pop your chocolate cream in a piping bag fitted with a large round tip and pipe along the edges. Decorate with fresh raspberries. This recipe was first published on Sweetest Menu in February 2016. Aww I’m so glad to hear that Jayde! I actually just made it again last weekend so I can relate ☺️Thank you for your kind review! I’m just about to make this. But I have made a no bake cheesecake before with no Gelatin and it fell apart. So how can this one be guaranteed that it won’t . Hi Holly, I’ve never had a problem with my no bake cheesecakes holding their shape. Just make sure you whip your cream well and you shouldn’t have a problem. I love no bake cheesecakes and I love that this one has NO gelatine – makes it so easy! Amazing! So glad you enjoyed it! Did it fall apart with no Gelatin in it when u cut it up ? Hi, no it looked great, like the photo. I have never made a no-bake cheesecake. Or a baked one, at that! I need to get on it. I’ve always meant to, but I just have never gotten around to it! And it’s so funny your love The Cheesecake Factory, because I have been there once MAYBE twice in my life. Hahaha. But hey, if you love it, more power to you! This looks and sounds delish! How can you go wrong with an Oreo crust?! This looks heavenly! Love that it is no bake too. I live in Seattle, but almost never go to the cheesecake factory, but you’re making me want to go run down there right now. This no bake cheesecake looks so creamy, rich and chocolaty. I love how there is no water bath needed. I love cheesecake and this version looks fantastic. That creaminess! Cheesecake is my biggest, number 1 weakness. I would eat it all the time if I could. Love the look of this – especially with the raspberries! I live in the U.S. but I’ve never been to The Cheesecake Factory. Can you believe it? That’s what happens when you live in the middle of nowhere. 😉 But I am definitely craving a slice of your cheesecake right now. No bake recipes really are the best, and this is downright beautiful! I love Cheesecake Factory too! This is a gorgeous looking cheesecake! And the fact that it’s no bake is such a bonus! 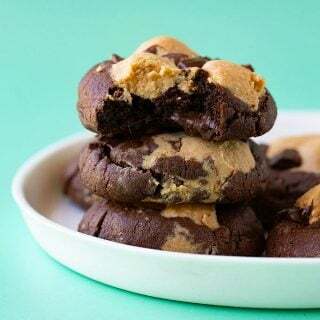 Makes it so easy to make (and then to eat it all up)! OMG Jess! This cheesecake looks amazing! I love no bake cheesecakes and so does my husband Tom! And that Oreo cookie crust! Yum! Thanks Mary Ann! No bake cheesecakes are delicious! Eeeep, this looks so good Jess! You’re giving me serious FOMO when you talk about The Cheesecake Factory. Is that the place where Penny in The Big Bang Theory works?? I’ve never been to the States but I’d like to…one day. I’d probably be shocked at first but I know I would love it. If I go, I know who I’ll be asking for insiders’ tips on the best places to eat 😉 I’m loving the look of everything about this cake, from the fluffy chocolate goodness, to the fresh raspberries perched on top, to the perfectly piped swirls around the edges. Gorgeous in every possible way! So gorgeous! No bake cheesecakes are the best – who wants to worry about water baths and cracks anyway, right?! 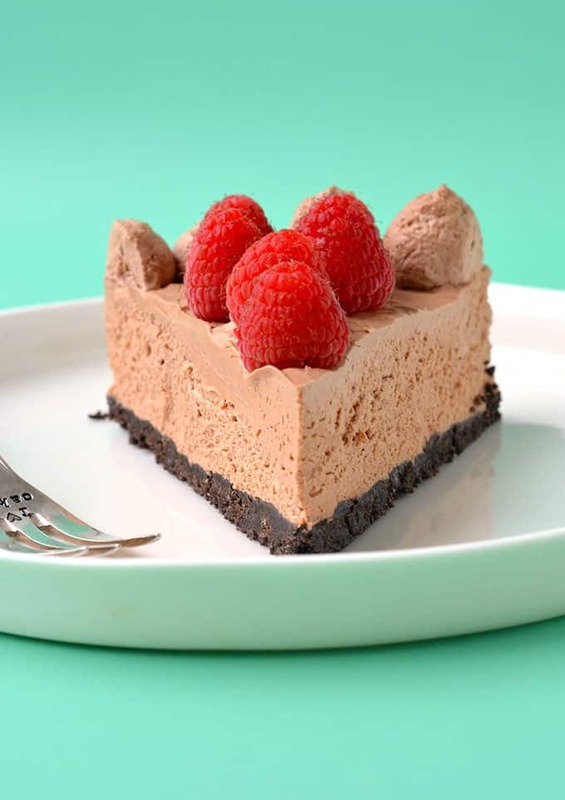 It is hard to beat chocolate & raspberry too. Oh this looks sooo incredible! I love no-bake cheesecakes…so much lighter and fluffier! I love this chocolate one…plus oreo crust? SOLD!